If you're going to Wizard World Chicago this weekend, drop by the Dark Horse Comics booth. I'll be signing there starting at noon on Saturday and 1 p.m. on Sunday. See you then! The problem with having a blog when you don't really have time to blog is it tends to become a collection of product announcements and convention appearances — interleavened with remembrances for people who you either knew or didn't know, but who influenced your life in some way. You don't have time to write about the mundane events of the day (and I am not always moved to, anyway) — but when someone passes on, you fire up the computer. It seems to have become something of an impulse reaction for everyone, at least according to the woman on CNN just talking about it. I am greatly saddened to write today of the passing of my favorite comedian, George Carlin. I find that I write that "favorite" without qualifications, because whereas favorite bands and authors and actors may change as you age, George's comedy has pretty much followed me along all my life. My big sister had a copy of Class Clown we listened to in the 1970s — strangely, she never played for me the last cut on the B-side, for fear of twisting my young mind and losing the war for the allies. (I figured it out, later.) Then again with my buddy Bob on the highway to Spring Break where we had nothing but Tom Lehrer albums and A Place for My Stuff, which we listened to about a dozen times on the road. Then later with the discovery of the earlier albums — including Killer Carlin, the pre-Lenny Bruce material he did teamed with Jack Burns — and AM/FM, in which you can literally hear the guy reinventing his routine. The B-side is full of his old "pieces" like game show send-ups and the fake news reports, whereas the A-side is more his raw stream-of-conciousness stuff. I think it's interesting how strains of both kinds of humor would continue to come together and combine in different forms over the years. I'd hear a bit on one of his HBO specials — or at one of the live concerts of his I got to see — and I'd be able to sort of trace its lineage a little bit. I did see him in concert, as I said, a couple of times at the grand Memphis Orpheum and then once, remakably, at a tiny casino room on a Wisconsin reservation. I was continually amazed at how he never stopped working and creating new material — and was willing to spend so much time out on the road at these little places, working on the new stuff. Which was amazing to watch, too — some bits of that backwoods concert that would turn up in the next HBO set and some he'd discard, but he delivered it all like it was part of a routine he'd been doing for years. I always liked seeing him turn up in movies — Car Wash and Bill and Ted both being better films than they probably had to be — and I tried to get all his books, as well — my favorite is the big over-sized poster book, full of bizarre stuff including his arrest record for indecency in one of his concerts. But I'll prize the audio routines most of all — and I know I'll be listening to them until the electrons wear off the CDs. This weekend's irony is that I had just written a Sword & Sarcasm sequence, to be published in a few weeks, inspired by one of his one-off lines. I didn't know this news would be coming, obviously, but either way, it's intended as a tribute. 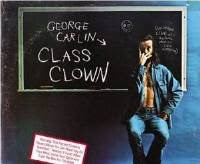 Carlin once said in a routine that he didn't want to be buried — "I want to be blown up! ", in a field with all his friends watching. I've used that line, on occasion, too. However he's memorialized, he will be remembered. "Now if we could only prove you stink in a court of law..."
Readers in France might also check out Comic Box Extra #3, their big Iron Man issue — including an interview about my own Iron Man work. Just got my copy — it's a great looking magazine!